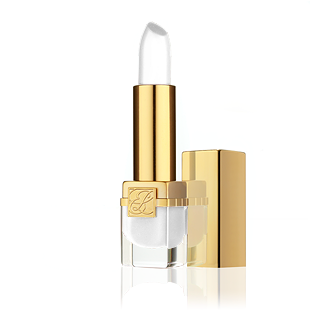 Estée Lauder is a famous makeup brand and it mostly known by its dominant blue-gold color for its packaging and logo. 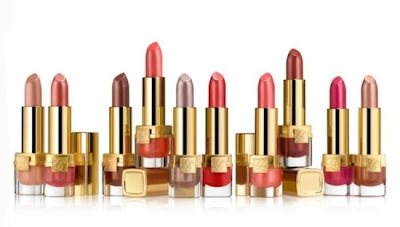 Estée Lauder makes makeup product with high quality standard and beautiful shades to choose. It's perfect for all woman in this world, either Asian or Caucasian. I like Estée Lauder for its blue-gold packaging. It becomes a trade mark of Estée Lauder and blue-gold colored of Estée Lauder distinguish Estée Lauder from any other makeup brands. I know Estée Lauder since many years ago (when I was in junior high school) because my mom using Estée Lauder's makeup products. At that time, I haven't known about makeup or beauty things related, but I memorize Estée Lauder's blue-gold packaging until today. That's why when I see a blue-gold or dominant gold colored on a makeup packaging, Estée Lauder is the first brand which comes to my mind. 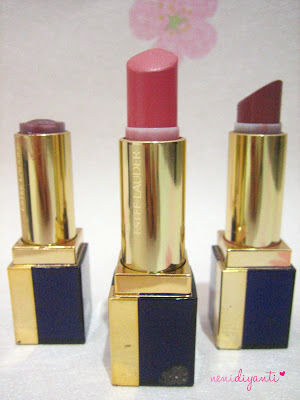 I adore Estée Lauder's lipsticks because they are perfect. It doesn't make my lips dry and the colors are gorgeous. That's why I own three Estée Lauder's lipsticks in my makeup case. Like mother, like daughter. My mom also loves Estée Lauder for their lipsticks. Estée Lauder's lipstick is the best product (for me). I love Estée Lauder's lipsticks and if I should pick the must have item from Estée Lauder, I will definitely say Estée Lauder's lipsticks! Geez, suddenly my childhood memory about that blue-gold brand comes back. When my mom putted lipstick on my lips for the first time. She used to put Estée Lauder's lipstick on my lips as my first lipstick ever. 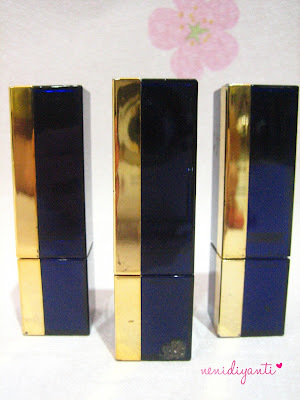 At this time, I have three Estée Lauder's lipsticks which comes in blue-gold packaging. I know it's an old packaging from Estée Lauder, but hey I like Estée Lauder for its blue-gold packaging, so I don't bother with it :) I also borrow my mom's Estée Lauder's eye shadow and lip conditioner sometimes xD Btw all of Estée Lauder's lipsticks are given by my mom. #LOL Since I can't afford Estée Lauder because its products are too pricey for me. I admit that I'm just a newbie on makeup things, but I'm the one who want to learn more and more. I've came to some beauty events (you can read all the event reports on my blog) since the first time I joined IBB group. And the last one, I attended a beauty class which held by Kiehl's (but I haven't write a report about this one :p). I took time to go to those events because by attending a beauty event I always get more and more knowledge about makeup (either free or not, I don't really care). It makes me know more about makeup and beauty. I like to get many information about makeup and beauty from different resources, different speakers or different beauty events.